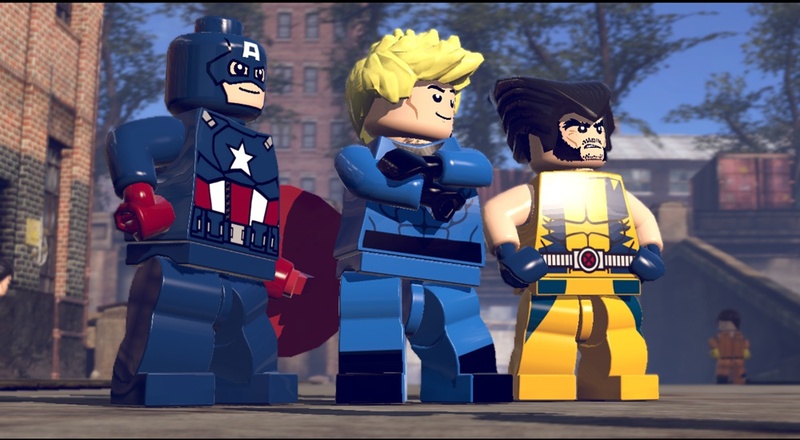 When you first hear the title Lego Marvel Super Heroes, it may sound like it's a game that's trying to cash-in on the successful Marvel movies (and recently, the promising Agents of S.H.I.E.L.D. TV series). But once you actually pick up a controller and get to smash cars with the Hulk in the first few minutes, you'll find that Lego Marvel is a solid, humorous game with a few issues that detract from its heroic deeds. Lego Marvel Super Heroes begins with Tony Stark a.k.a. Iron Man and the S.H.I.E.L.D. Helicarrier chasing down the Silver Surfer, who is suddenly shot down by a mysterious aircraft. The Silver Surfer's surfboard (say that three times fast) ends up destroyed, scattering cosmically powered Lego blocks across the world. Turns out that the nefarious Dr. Doom is working with Loki to build some kind of Doom Ray (of Doom) of out the Cosmic Cubes, and it's up to SHIELD and Marvel's greatest heroes to save the day. While you may need to have a deeper understanding of the Marvel universe and all its characters to fully appreciate all the references Lego Marvel throws around during its story missions, the really nifty part of this game is how you're given the opportunity to play as a multitude of heroes (and villains) from the Marvel Universe. You'll get to play characters hailing from the likes of The Avengers, The X-Men, and the Fantastic Four, and battle against a wide variety of supervillians, including Magneto, Doctor Octopus and The Red Skull. And thankfully, everything in the story stays light and cheery, with humorous dialog and slapstick jokes in the background - no overly dramatic or grim character moments here, just random cameos of Deadpool. Some of the dialog may fall flat (One quip from back-from-the-dead Agent Coulson about wishing he had Wolverine's healing ability was particularly groan worthy), but there's scenes like Thor's melodramatic introduction mid-game and Spider-Man's constant lamenting how angsty he has to be all the time that'll at least bring a smile to your face. Each story mission mostly has you button-mashing your way through various types of minions, but you also have platforming and some simple environmental puzzles to deal with as well. The puzzles themselves center on using a particular character's special abilities to unlock a door or activate an item, such as using Captain America's shield to trigger switches or hacking a computer console as the Black Widow. You'll always be in control of several characters at once during a mission (unless you have a co-op buddy), but switching between characters is a simple button push. If you're playing solo, your AI companions will hold their own in a fight, but they do have a tendency of getting in the way of your own attacks. Thankfully, the awkwardness of killing off Iron Man by accident while playing as the Hulk is short-lived, as death is little more than a temporary inconvenience and characters respawn almost instantly. While most of the super heroes are limited to running around, several characters, like Thor, Iron Man, and the Human Torch have the ability to fly, which can unfortunately be a problematic experience. Hovering in place and moving slowly over a gap between two platforms is simple enough, but in some of the story missions where there's a fixed camera, or even in the open world parts of the game, it's way too easy to accidentally send your airborne hero careening down streets at a nearly uncontrollable high speed. Vehicles don't fair too much better; the default car controls feel overly sensitive at first, and maneuvering a massive Quinjet across New York's skyline will probably result in a few accidental crash landings. Similar to previous Lego games, Lego Marvel also grants you access to an open-world, Lego New York to explore in between story missions. And much like previous entries in the Lego series there's also dozens, if not hundreds, of collectibles scattered across the game world. Various side missions, like helping a construction worker recover his shovel, racing through checkpoints in a borrowed car or finding secret locations can all unlock extra characters or grant you access to more costume items to use in the character creation andcustomization menu. Plus, many of the story missions have areas that are inaccessible until you unlock a character that has a particular ability, so there's some incentive to go back and replay older missions to try to get more loot or collectibles. Bottom Line: Lego Marvel Super Heroes is a light-hearted adventure that's got a few technical flaws, but is a nice, relaxing super hero game that's free of all the grimness we've come to see in recent years. Recommendation: Any fan of either Lego or Marvel Comics should check out Lego Marvel Super Heroes, especially if they're looking for something comedic and kid-friendly to play. But if you don't have more than a cursory knowledge of Marvel in general, you may not enjoy it quite as much.